Village Builders will increase your comfort and lower your energy bill. Period. Cutting air infiltration in the cellar, your outside walls and your attic prevents cold air from coming into the cellar or through the walls, then exiting through the roof because of what is known as “the chimney effect”. Because warm air rises, it wants to escape through your ceilings, attic and roof. If you stop the chimney effect, it stops drafts. You decrease energy costs (because the furnace isn’t constantly running to heat the new cold air introduced through the holes) and the heated air stays in your home longer. 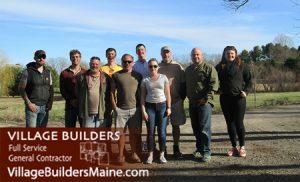 Village Builders knows how to help you keep your home cooler in the summer and basking in draft-free comfort through even the worst Maine winter. Best of all, we’ll help you bask in the glow of significant energy savings! 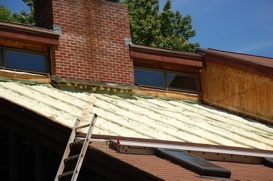 Like all of our projects, we’ll work with you to explore all the options and install weatherization solutions that fit your situation and budget. From environmentally friendly, mold resistant insulation’s, to energy efficient windows and doors, to alternative energy systems, we have the materials and installation expertise to keep your home as comfortable and energy efficient as can be. Dan, the owner of Village Builders is certified in air transfer and thermo-dynamcis, as well as having a certification from the clean air council. He has created systems to enhance the energy saving processes in homes and businesses. We are extremely focused on clean and efficient energy saving methods at Village Builders and we portray that in our work.